$13,000 wow that a lot of cash. Fun how something so expensive only gets a few moments on screen and in the background at that. Thanks for sharing the story. Do you know what happened to model and where it is now? Yeah and the request wasn’t even a valid one, especially for a piece of background dressing, had it been featured that would be different but overall it was a very silly request!! !, I believe it sold in one of the many liquidation auctions a few years back. The model was indeed sold in a It’s A Wrap auction, and you can find the link to the listing there… I remember I checked the whole scene, and as it was aired, only the shadow of the model could be seen…. Unbelievable on so many levels. That is one amazing piece of art. Thanks for sharing – I love this stuff. Thanks John, nice article but I made about three or four for that cost, lots of hard work but the result was a lot of fun for me! It’s worth it because it looks so good. Agreed. Sometimes great editors do make great directors. Robert Wise comes to mind. Other times, however, it just doesn’t work. Baird is an amazing editor, having worked on “Superman:The Movie” and a number of the Bond films, most notably “Casino Royale.” His talent didn’t extend to the director’s chair, though, and his career there was short. Even though Baird’s decision to have the Ent-E made “CLEA-AH” was unnecessary and costly on many levels, Mr. Rizzardi created a beautiful and unique piece of Trek art. Congratulations on a job very well done indeed! I love seeing the dedication to background details the production teams put into Trek as whole… it really makes it feel like it’s a believable world rather than simply a collection of sets and performers. Agreed, though I would need it to at least big enough to keep the rain off as my wife would throw me and it out if I bring in any more collectables. With great power, comes great responsibility. Giving the OK for an $8,000 prop when there’s already something reasonably similar on set seems a bit much, but I do remember this model very distinctly from the scene where a Shinzon hologram appears in the ready room. And she does look very nice too. That movie was an abomination. The model is cool though! 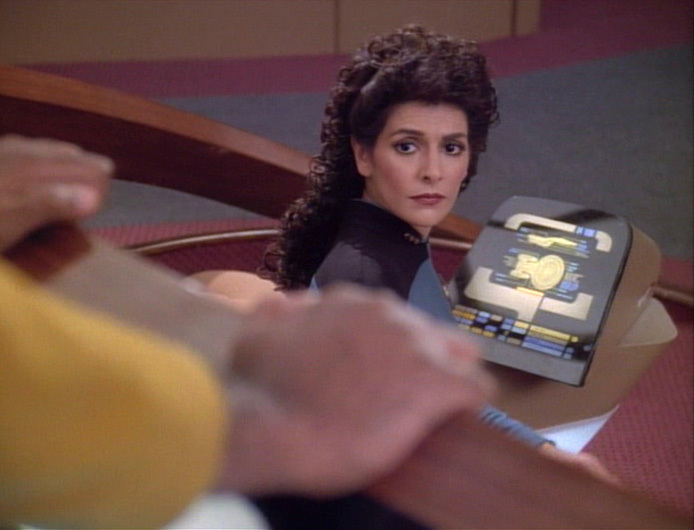 Jon: Could you please do me a favor and get me a picture of the console on Picard’s chair when open, the one with the picture of the Enterprise-D overhead view? I managed to find some, I was googling Picard when I should have googled Riker! Geesus. And I never even noticed it. Worse, even I know you guys like to use those store-bought models for those ones so they cost next to nothing. How very irresponsible of him.